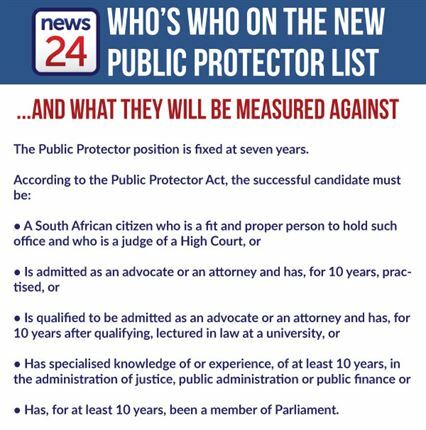 View the profiles of some of the candidates nominated to be the new Public Protector here. Cape Town – The committee tasked with replacing Public Protector Thuli Madonsela is expected to whittle down the number of candidates to a maximum of 10 by Wednesday afternoon. And these candidates will have about 10 to 15 minutes to sell themselves to the committee during the interview process, which will be held August 11. The candidates will be assessed on character, experienced, knowledge and skills for the position and will have to make a presentation to the committee. The committee on Wednesday discussed the criteria for shortlisting candidates. They will look for a candidate who is beyond reproach, with integrity, honest, impartial, and independent with leadership skills and forensic investigative skills. They should also have human resources capabilities, be able to communicate and have management skills. This is over and above the minimum requirements for the position as set out in the Public Protector Act. "Fit and proper" would also be an important part of the process. Committee chairperson Makhosi Khoza said they would not spend more than one hour on each interview. This would be strictly enforced, she said, to prevent MPs from rambling on as well. “That’s why we have a time limit in Parliament, because they know what kind of animals we are, we love to talk,” she said. ANC MP Bongani Bongo had suggested 20 minutes for the presentation, but his suggestion was mooted when MPs said he was too generous with the time. “I honestly cannot imagine spending a whole day listening to candidates rambling about themselves for 20 minutes at a time,” DA MP Glynnis Breytenbach said. The committee will meet at 14:00 on Wednesday to complete the shortlisting process.